The stock markets are celebrating the potential deal on the debt ceiling. Although a catastrophe has been avoided for now, it remains to be seen how much damage was inflicted on growth. My bias is to assume that this would only cause a temporary slowing in activity, but that is still dangerous given the fiscal drag already created by the sequester. "It's fair to say that growth has disappointed us to this stage. We are behind where we thought we would be, say a year ago or for that matter six months ago," Poloz said at a news conference following a meeting of finance ministers and central bank governors from the Group of 20 nations. The previous Monetary Policy Report (from June) argued that the dip in core inflation was due to one-off factors. However, the six-month rate of change (at an annual rate) is signalling that the annual core inflation rate will be bumping along near 1% for some time longer. 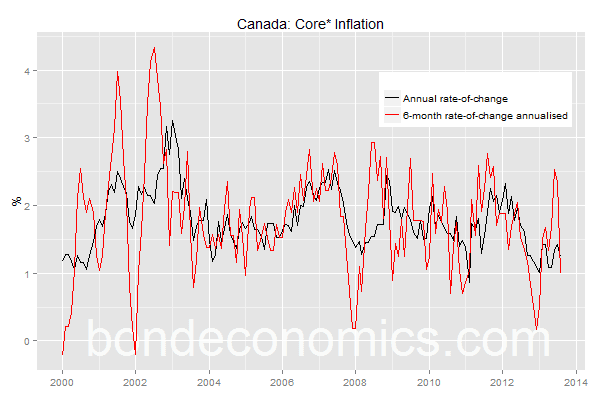 Given that inflation should tend to rise during an expansion, I expect that the Bank of Canada will probably keep its forecasts largely unchanged, at most scaling back the time core inflation hits 2% a couple months later than its previous forecast of mid-2015. Even if one is not too interested about Canadian developments by themselves, Canada should be a "canary in the coal mine" for U.S. inflation (assuming the Canadian housing market does not blow up first). The Canadian economy is highly integrated with that of the United States, and it is much closer to closing its output gap. Obviously, short-term factors (like the impact of taxes) will be different between the two countries, but Canada's underlying trend inflation should lead that of the United States.